One FINAL Offer... and we really saved the best for last! Get A Massive "Insider Discount" On 3 Of Our BEST Software Tools... AND take complete ownership for one of them! Watch this short 3 min video - it's super important! 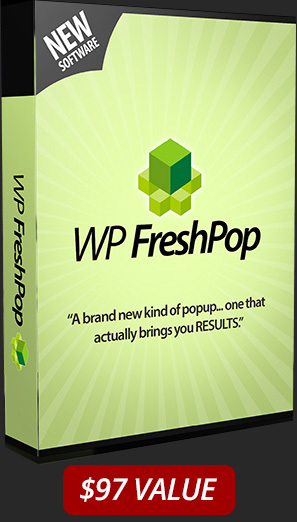 WP FreshPop converts that traffic into SALES and $$$ PROFITS! Very few are using this "FreshPop" technology right now.. and that's what makes this software tool a powerful and overlooked "passive income generator". With Magic Rank Tracker you can check your site's position in top search engines, monitor rise and fall of your organic rankings, keep track in your rank history and discover even more highly PROFITABLE keywords to go after. All this can be done with only one tool.. Magic Rank Tracker. Others had to pay $27 to $47 for this software by itself. And you get it in this exclusive software bundle on this page. WP Viral Click is the 3rd software that we are including in this exclusive bundle (ONLY for New Traffic Trapper Members). And WP Viral Click allows you to leverage off of highly targeted "viral" traffic. When we say this is targeted traffic, that means this traffic will either BUY or SUBSCRIBE.. and this is exactly the kind of traffic you want to hit your site(s). And the best part about this 3rd software, is we are including Full MASTER RESALE Rights to it... along with ALL the promo and sales material so you can completely sell WP Viral Click as your own! This by itself is easily valued at $1000s... because it can make you $1000s! And these Master Resale Rights are only for you guys as Traffic Trapper Members. The more traffic I generate, the more money I make - it's as simple as that. Unfortunately there's not enough hours in the day to use every single social media site to the maximum... that's unless you have a tool like Traffic Trapper, which automates all of it for you! Traffic Trapper is an absolute must-have for anyone wanting to make money online - it saves you a TON of time and automates most of the boring social media tasks. "Thanks, but no thanks on the generous $70 OFF Discount of this exclusive software bundle x3..."